Circular knitting or knitting in the round is a good way to create a seamless garment. A classical seamless sweater knitted from a neck line is a good example of knitting in the rounds. When knitting circularly without adding stitches, you create a seamless tube. Outside of this tube always faces you. Side facing you we call the "right" side of your knitting. You work in a spiral and don't turn your work at the end of each row. To produce stockinette fabric, for example, you don't need to work one row of knit stitch, and then one row of purl stitch. Knit stitches have to be worked all the way. 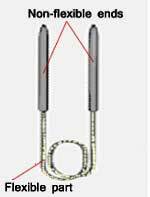 A circular needle has a flexible link between two pointed (usually metal) needles. After casting on stitches in the regular way and joining them in a circle, a seamless tube will be created while knitting in the round. The first video presented , demonstrates knitting in the round. A knitter supplies yarn into working zone using her right hand (English style of knitting). There is no too much difference if you use Continental style of knitting. -:) Your left hand will supply yarn. 2.Using double pointed needles for circular knitting. There are usually 5 or 4 of them in a set. 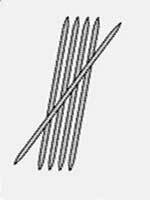 After casting on, all stitches are evenly distributed among the working needles (two, three, or four needles). One needle is used to knit off. A second movie below will teaches you how to distribute all stitches among 4 working needles. A knitter works in Continental style of knitting (supplies yarn using her left hand). The last video will give you a little more explanation how to avoid a gap while you join all stitches in a circle using either circular or double pointed needles. Very many knitters prefer to use circular needles for the flat traditional knitting where at the end of each row you have to turn your work. Unlike traditional needles circular needles distribute weight of your knitted fabric into the lap making it easier to work with. Besides that, they are very handy if you have somewhat restricted space for knitting in a car, chair, etc.